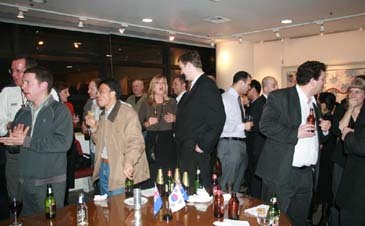 ANZCCK's Sundowner going on in Seoul on Feb. 22, 2008. If you are interested in Australia and New Zealand, or if you want to meet with businesspeople from such countries, there is a social gathering called the "Sundowner" hosted monthly by the ANZCCK (Australia New Zealand Chamber of Commerce in Korea). ANZCCK members walk in for a fee of 10,000 won. For nonmembers it's 20,000 which does not include drinks. An additional 20,000 won will reward you with 10 of your favorite beers or wines. Along with the alcoholic beverages come finger foods. Usually, the Sundowner boasts a plethora of top business executives offering a wide range of social opportunities. More than 200 people — local business folk, embassy staff from the Australian and New Zealand embassies in Seoul, and legal consultants — attended this month's gathering hosted by ANZCCK on Feb. 22, 2008. The room was nearly filled and some people were pushed up against the Boomerang Bar within the Australian Embassy on the 11th floor of Kyobo Building in Jongno-gu, central Seoul. The February 22nd Sundowner started at 6:30 p.m. and lasted until 9 p.m. Activities included a raffle and post Valentine festivities featuring Korea's own "love shot." The crowd enjoyed their favorite drinks imported from their native countries of New Zealand and Australia amidst the unique entertainment. PR director of ANZCCK could be seen handling bar duties throughout the night. She felt that "more people than expected had showed up but all seemed happy." She claimed that "being a member has multiple benefits for the business minded." The event's environment was cozy and friendly. A host of consultants, CEO's, and executives from major companies could be seen mingling with their international or local friends and partners. Among the VIP participants was ANZCCK Vice Chairman Les Edwards. Mr. Edwards serves as vice president of the local advertising joint venture "Lee & DDB." When asked about the essence of the Sundowner, Mr. Edwards said "the event is aimed at making contacts, discussing interests, and exchanging information." Another important aspect of events like this according to Mr. Edwards is "to bridge the social gap between Koreans and the relevant expats." For those interested in joining the ANZCCK, the criterion is to either be a native of New Zealand or Australia, be a part of their respective embassies, or to be a representative of a company or organization with business ties to such. Some of the benefits include meetings, social functions, and networking. For a comprehensive look at the membership dues and perks go to the ANZCCK website (www.anzcck.org). The ANZCCK has over 250 members working actively to improve business ties between South Korea, Australia, and New Zealand. Started on May 4, 2001, the chamber has since become an influential force in developing interests in multiple industries between the three countries including film, multimedia, education, and tourism. For details or inquiries contact the ANZCCK at 790-3308 or exec@anzcck.org.